. Acne Control . Facial Peels . Eye & Facial Serums . Moisturisers .
. Stem Cell for Skin . Cleansers . Skin Toners . Kits at Discount .
. Needle Free Dermal Filler . Other Products . FaceBook Page .
. Clay Mask . Tanning . Skinfab Video Link Advice Channel .
. Hair Regrowth Serum . Paypal.me/Skinfab.
. 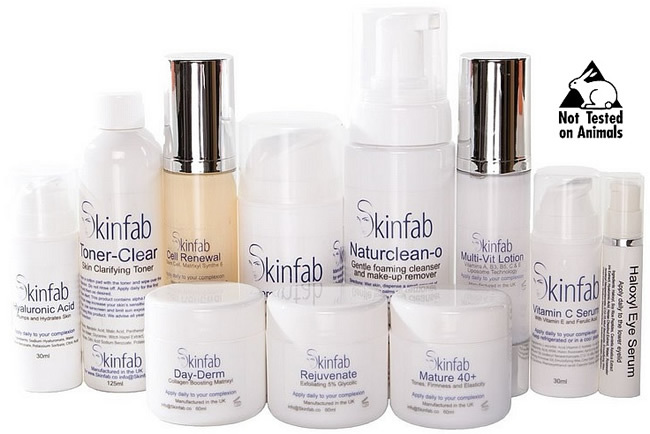 Independent Expert Review of Skinfab .
. Customers Reviews of Skinfab . Contact Skinfab . Welcome to Skinfab forever youthful skincare and haircare. This site is verified and secured for safe payments. We sell the newest advanced skin and haircare treatment products in the World, dealing with anti-ageing, acne, sun burn, sun protection, self tanning, hair balding treatment etc. Our philosophy is to provide high quality active skincare products for both men and women, used in the home and by professional spa clinics that work at affordable prices. We are an online-store and not a high-street-store. Therefore we can sell high quality ingredients products, without the unnecessary expensive attractive pack-aging. No Frills packaging saves you money, as we feel that you the customer want great skincare without spending on fancy packaging. With that in mind, all the information you need about each product is written on this web site, and not the products packaging. We manufacture all the products on sale here in the UK and we insist on limiting the use of chemicals by using natural, organic or Ecocert approved ingredients wherever possible. We do not use synthetic ingredients in our lotions, serums, and cream bases. We avoid mineral oils and silicones, preferring to use natural plant oils and esters. We do not use artificial preservatives, fragrances, or colourings in any of our products and you will never see parabens in any of our ingredients listings. We sell Worldwide, however please note that we do not sell to Italy due to their inefficient postage system. The UK GBP price shown on each product is with free UK postage. There is an added option of paying an extra £5.50 for international buyers to cover postage per order, as can be seen on our products pages. We also offer trade discount, so please contact us for information. We offer free UK postage, so all product prices shown is the price you pay, there are no hidden charges when checking out. We sell a wide range of skin products that can be seen via the links from this page, so please feel free to navigate around the site to learn more about the amazing new technology of Skinfab in all our products. All our products are manufactured just three weeks prior to you buying, so all our products are fresh. Our products have two, six or twelve months of life once opened. This symbol on the right means 12 months, as can be seen on most of our product labels. Even though all our products are safe, we advise you to consult your doctor if for any reason you have a skin condition, and patch test for 24hours before the full use of any beauty product. "Like" our FaceBook page for a chance to win our products for free, link to page "Skinfab FaceBook"